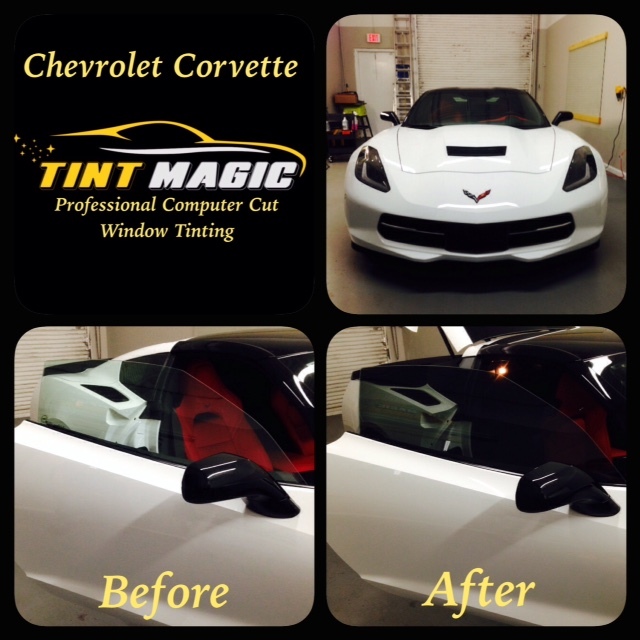 Chevrolet Corvette Window Tinting at Tint Magic Window Tint Coral Springs, we apply Gold Package Window Tint 25% all around. Styling takes the Corvette in new directions, even if around familiar themes, both inside and out. Sharp lines, crisp angles, and vents aplenty give a definite supercar air to the design that matches the car’s performance. It’s wide, low, and looks fast even at a dead stop. Inside, the Stingray’s design is much improved over the previous generation of the Corvette, and while nothing changes in the standard model for the 2015 model year it retains its refreshing and surprisingly luxurious look. The Z06 adds to the Stingray’s exterior and interior design with wider fenders, an array of aerodynamic add-ons, and a performance-themed cabin treatment. The Corvette Stingray—the seventh generation, or C7—competes with the world’s greatest sports cars, and once again we’ve named it to our 10Best list. With a 6.2-liter V-8 making 460 hp and 465 lb-ft of torque, you can now choose an eight-speed automatic transmission in addition to the standard seven-speed manual. It sheds its unrefined reputation and has an interior befitting its stature. Offered as a targa or convertible, the Corvette is a performance bargain that you must drive to believe.